The Best Books Ever: An Absence of Light by Meradeth Houston ~ Tour Review & Giveaway ~ By Jaime! 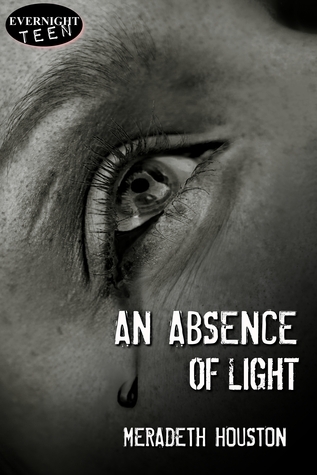 An Absence of Light by Meradeth Houston ~ Tour Review & Giveaway ~ By Jaime! An Absence of Light does not start off lightly, easing you into the story and Lee's world. HECK no! It starts off with a heartbreaking BANG, and Lee having to run away from everything that she has ever known. Running from the Shadows. She doesn't know what they are exactly, but she knows what they can do. She has since she was a little girl. Now, they have done the unthinkable, and Lee blames herself for it. She vows that she will have revenge, and prevent the Shadows from doing to someone else what they have done to her. After running from her home, with no clothes or money or anything, Lee ends up stealing a car and driving as far and as fast as she can. She ends up running out of gas at a mechanics shop. Here, she meets Manuel and Adam, and she thinks she may finally have found the means to exact her revenge. She might end up finding more than she bargained for though. The Shadows are changing, their behavior becoming more aggressive. What does it mean? And what could Lee possibly have to do with it? I truly enjoyed this story. It was very fast-paced, and I enjoyed learning more about the shadows. Lee was a great character. She has lost everything, but she doesn't give up. She fights. She has a wry, sarcastic voice, and I found it endearing! Manuel was a ray of sunshine in the story, as was Nana. I enjoyed their roles in the story, and what they meant to Lee. Adam at first was not so easy to love. He was closed off, and distant. But as the story progressed, I started to like him more and more. The Shadows were awful, creepy things! The Shadows, the darkness was the main focus of the story, which I appreciated. Romance was a part of the story, but it never overshadowed (ha) what the story was meant to be. As I said, this one is quick paced, and definitely interesting. While at times, it was a bit predictable, I just didn't care. I was enjoying it too much. And there was a nice twist to look forward to! Great story, easily recommended. So recommend it I will! Go ahead and give this one a shot. I think it might just surprise you! This sounds like a really intense and entertaining read and I love that it really pulls you into the action from the start! Great review, Jaime! I love it when you enjoy a book so much, possible negatives don't matter as much. I also love it when a book starts out strong, and it sounds like this one did. Great review! Now that I'm entering the giveaway . . . I haven't read anything by Meradeth yet! An Absence of Light sounds really good, though.